I’ve been meaning to try a few projects from Amy Butler’s In Stitches book for some time. Last week, I was feeling the need for a quick project that would give me some instant gratification. The lounge pants looked like just the project to fit the bill. 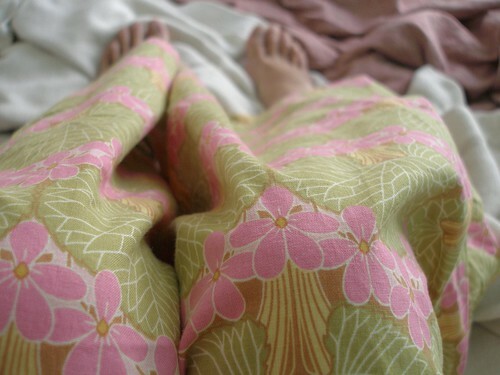 While sewing pants is extremely challenging, sewing pajama pants is super easy. Amy’s pattern provides you with the top part of the pattern and requires you to draft out the legs of the pants. Easy. I decided to go with some Amy Butler fabric, the print is called Nouveau Trees. I have a particular fondness for the pink and green combination, it reminds me of my childhood bedroom. The sewing is very simple. It took me about an hour, perhaps less. I omitted adding trim to the bottom and opted to use some of the cute embroidery stitches on the Bernina Artista to hem the pants. As I was sewing, I thought about how these would make a really nice gift. It wouldn’t be hard at all to make several pairs quite quickly, once you had them all cut out. The pants are really cozy, perfect for these chilly nights and mornings. From what I’ve read online, most people doubt the extreme wideness of the legs as they are making the pants and then fall in love with them once they are done. This happened to me too, they just seemed ridiculously wide. Now, I love them. On that note though, the next time I make these pants (there will definitely be at least a couple more pairs), I will try slimming down the leg a couple inches, now that I know my sizing. 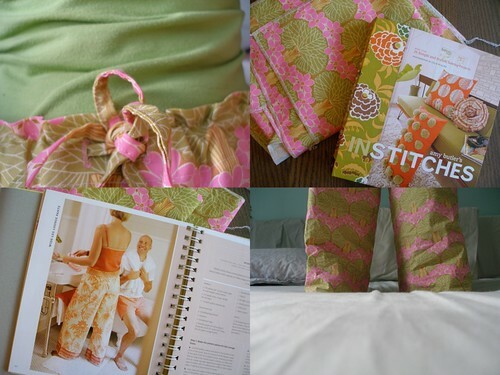 There are a bunch of other projects I’m planning on doing from this book – the bedside organizer and the kimono robe are on the top of the list. If you need a fun, simple project that you can wear, this is it. You’ll be so happy when you’re wearing your new lounge pants in bed watching episodes of Gossip Girl in the dark. oh my cuteness. i love that print. so fun to be able to lounge around the house and wear. I was thinking about making those pants but they seemed wide in the photo…never even considered making them slimmer but I just might give them a go for presents like you mentioned. Oh and the kimono robe?…That is my favourite thing in the book.I can’t wait to give it a go! bobbinoggin – I’m going to have to make another pair very soon, since it is all i want to wear when i’m at home now! staci – you should really try this project. the sewing is so quick and easy. you’ll be lounging in no time. linda – i think i could easily take off an inch on all the side seams. i’ll probably try it again very soon and i’ll report back with the slimmed version. you’re totally right, the kimono is the best project in the book. it’s incredibly cute. Ah! I’ve been meaning to make this project! And the kimono robe! I reckon if I want to start sewing clothes, I better begin with a couple of easy projects. I’ve made 4 pairs to date, all out of old bedsheets. I love this pattern and even enlarged it by some for my husband and reduced it for my two kids. Love your pants… you can check out mine here…. Those look great! Perfect fabric choice. I just received her In Stiches book for a birthday gift and cannot wait to try some projects. I love those lounge pants. I made a pair and they are so comfy! concha – the pajama pants are a great first clothing project. the sewing is easy and you don’t need to worry about fit at all! carol – wow, love that you’ve made a family of lounge pants! and very cool that they are from re-purposed fabrics. love it! courtney – you’re going to have fun with this book, it’s got such a good range projects. jessica – thanks for visiting. i love the name of your blog!! Where can I buy the lounge pant pattern? Hi Lisa! this lounge pant pattern is in Amy Butler’s book – In Stitches. We have it at the workroom!